Dr. Mahdi Shahbakhti is an associate professor of Mechanical Engineering at Michigan Technological University, where he conducts research in the area of controls and energy. He is currently the director of Energy Mechatronics Laboratory (EML) at MTU. Prior to joining the faculty at Michigan Tech in Aug. 2012, Shahbakhti was a post-doctoral scholar at the Vehicle Dynamics & Control Laboratory in the University of California-Berkeley (2010-2012). 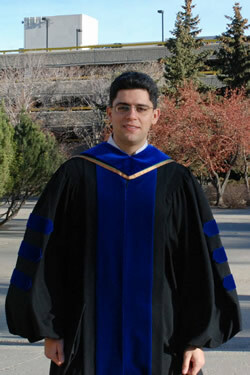 He received his PhD in Mechanical Engineering from University of Alberta in Canada in 2009. He worked several years on control of dynamic systems in the automotive (2001-2004), robotic (2000-2001), and HVAC (1998-2000) industries. An ASME and SAE member, Shahbakhti has been doing research in the area of powertrains, buildings, and controls for the past 17 years. His research has centered on developing dynamical models and novel control techniques with application in powertrain control, reduction of vehicular emissions, hybrid electric vehicles, and building to smart grid integration. He is the author of over 120 refereed publications in the field of powertrain, energy systems and controls. Shahbakhti has been an instructor for courses in controls, thermodynamics, hybrid electric vehicles, combustion engines and alternative fuels. He is the recipient of 2016 SAE Ralph Teetor Educational Award and 2009 Zita and John Rosen Teaching Excellence Award at the University of Alberta. He has also supervised/mentored more than 90 graduate/undergraduate students for research in the field of experimental study, modeling and controls of energy systems including powertrains and buildings. In addition, he has designed and organized several educational workshops in the field of combustion engines for high school teachers/students. His efforts were recognized with the 2009 Province of Alberta Graduate Citizenship Award and 2008 Award for Outstanding Contribution for “Most Youth Reached” in Canada’s National Let’s Talk Science program. Dr. Shahbakhti is a reviewer for over 20 international journals including ASME Journal of Dynamic System, Measurement and Control, Journal of Applied Energy, and Journal of Robust and Nonlinear Control. He is an active member of ASME Dynamic Systems & Control Division, serving as the vice chair of the Energy Systems technical committee and also secretary of Automotive and Transportation Systems technical committee. He has chaired and co-organized a number of sessions in the areas of modeling, fault diagnosis, and control of automotive, transportation, and energy systems.